Lunch….hmmm… Did I mention I had a deadline yesterday and so my 14 year old graciously offered to help with lunch? I was Chef (chopping vegetables, barking out orders, emailing attachments, and re-emailing attachments) and he was Sous Chef. Well, when I told him to add 2 cups of flour to the mixing bowl (homemade egg noodles for the chicken and vegetable soup boiling away on the stove), he assumed I’d meant for him to add them to the bowl of cherries (hand-picked last year) with a handful of sugar and a pinch of pectin thawing on the counter. Barely making my deadline, I rushed back to the kitchen for some quick kneading of the noodle dough. 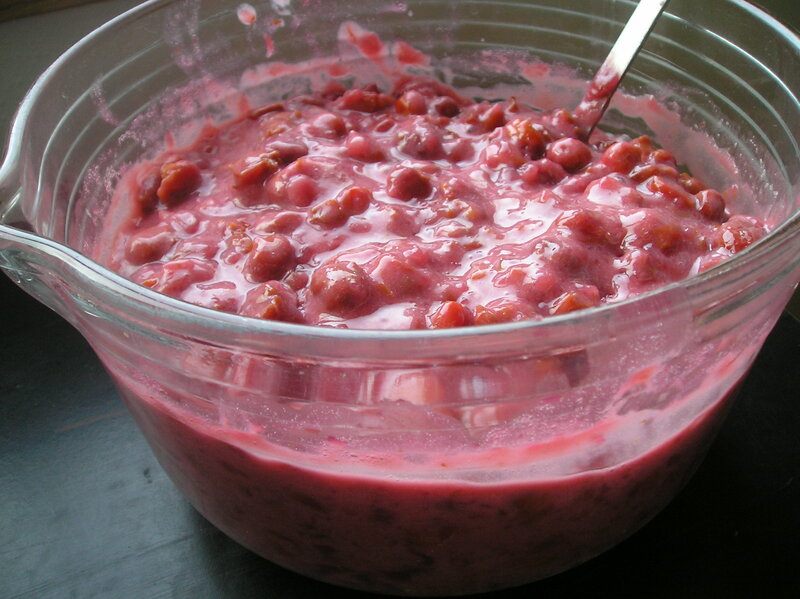 And then, I saw the bowl – a pink, pasty mixture of cherry delight. When life gives you lemons – right? Okay, we’re trained experts here, we can handle this. Added was a few more packages of frozen cherries and more sugar to thaw & marinate on the counter. Today, it was cooked down a bit and it’s now slated for cherry cobbler (writing my own recipe) and cherry turnovers (left over puff-pastry from the Asparagus & Gruyere Tarts made for Easter – AMAZING!!). It’s hard to think about lunch when you’d rather be a Pâtisserie Chef than just a plan old, boring Chef. As the critics began inundating with questions as to the identity of the Lunch Special, I started to grab. I pulled out my trusty 9×9 ceramic pan in a lovely, spring-green hue and buttered it (again real butter). After slicing the last few pieces of bread, I grabbed and quickly grated all the cheese ends I could find (we’re down to just cheddar – Gruyere doesn’t last here). I threw in some diced ham left-over from Easter; some free-range, organic eggs with their glorious bright orange yokes (indicating a high level of nutritional content); and yummy mushrooms who spoke (“eat me, eat me”) to me when I was rummaging through the fridge. Viola! The Lunch Special was in the oven. Ham, oh my! A ham hock still remained in the fridge. While lunch was baking, the ham was tossed in the crockpot on a low heat with some water. Last year, my attempt at Ham & Bean Soup became a copious amount of salty, mushy bean disaster. But, not one to give up too easily, I’m starting again – perhaps, I learned something and this year it will be tres magnifique… FYI – Mere de Chef doesn’t love Ham & Beans so her attitude may have created a biased that affected the whole process. Remember the cherries and puff pastry? 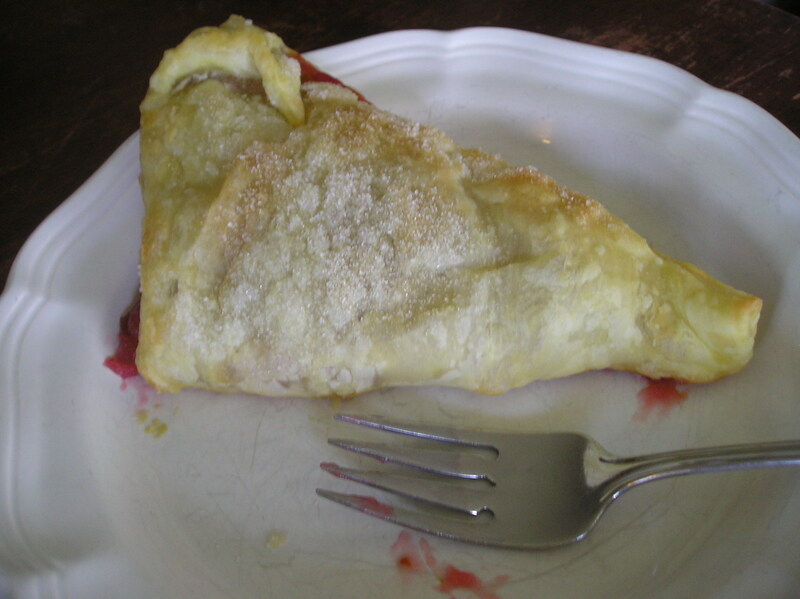 The Cherry Turnovers turned out divinely, and proved to be a triumphant ending to The Lunch Special. Mere de Chef can kick her feet up still donning her “power apron,” sip her green mint tea from mismatch chinz, contemplate her bowl full of cherries (literally and figuratively), lament another day without homemade yogurt, and plan for The Dinner Special… Welcome to Le Cafe! !